This brief continues the coverage of the Sectoral Innovation Foresight of Brief no. 216 by taking a closer look at seven out of the nine sectors that were explored in the project as part of the Europe INNOVA initiative: automotive, food and drink, knowledge-intensive services, aerospace, and wholesale and retail. The foresight study aimed to identify potential policy issues and challenges of the future. The emphasis was put on developments that could possibly have a disruptive effect on the sectors under consideration, on the one hand, and on developments that are likely to be of cross-sectoral relevance to innovation, on the other. The scenarios developed offered a variety of different futures with quite divergent impacts on the competitive landscape, technological progress, environment and society. The scenarios aimed to guide policymakers in considering specific scenarios but were also an attempt to prepare them for more than one possible future. This also helped gauge the extent to which policies maintain flexibility (‘robust strategies’) or focus on one single scenario (‘focused strategies’). Including the full results for each of the nine sectors would be an impossible task within the format of this foresight brief. Short summaries of the nine sectors will be presented instead. For some sectors short, summaries of the scenarios are included, for others only the key drivers are presented. The complete results are available in the nine sectoral foresight reports, which can be downloaded from the website (see references at the end). The automotive industry has been hard hit by the economic crisis. This has had a strong impact on its future strategic orientation and has triggered the transformation of the sector. Driving factors such as technical advances in developing power train technologies, new manufacturing strategies, market saturation, regulation, energy prices, and mobility behaviour have been considered to be significant. From a future-oriented perspective, the following four drivers can be considered as particularly influential: (1) income (customers may have more or less relative income available in the future), (2) energy storage (we may see breakthrough innovations with respect to cost and capacity in relation to this crucial component of alternative power train technologies or only incremental innovations), (3) mobility behaviour (we can think of a differentiation of individual mobility or may see a reduction and substitution by public transport), and (4) regulation (ranging from radical attempts to incremental regulations). The last driver is pertinent in this respect as it is influenced by policymakers; hence, policy – more or less proactively – has a considerable influence on shaping the future of the automotive industry. The construction sector is of considerable economic and strategic importance: the built environment affects almost every economic and leisure activity. The outputs of the construction sector affect our landscape, our environment, our living and working conditions – and will continue to do so for generations to come. It provides more employment than any other sector. And, more than any other sector, construction accounts for the use of raw materials and production of waste. The following trends and drivers resulted as being particularly influential, yet uncertain, in the 10-15 years to come: (1) the conditions for the financing of investment (Will there be sufficient public and private financing available? ); (2) sustainability (Will sustainability be market or regulation driven? ); (3) the role of the public sector (Will public procurement be price-based or performance-based? Will the public sector act as a regulator or as a business operator? ); (4) user-driven design (mass production vs. customisation, passive vs. interactive); and (5) labour (Will there be a shortage of people and skills or a surplus through immigration?). Currently, the picture of the food and drink industry as well as consumer choices seems to be mixed. Interests range from preferences for natural and minimally processed foods and drinks over specialised, fortified and high-tech nutrition to a diversity of convenience and fast foods. Many different factors, such as economic prosperity, ecological consciousness, environmental problems, food safety concerns, importance of health, technological progress, acceptance of new technology and economic prosperity, can have an influence on the direction of consumer and industry choices. The scenarios derived from the following trends considered as generally fixed within a short- to mid-term time frame: the increase in global population, a decline of population in many EU countries due to lower birth rates, an increase in life expectancy in EU countries (aging society), and increases in scientific and technological knowledge and possibilities. In addition, the following parameters were considered to vary across the different scenarios and account for their differences: economic prosperity (on a world, country and individual scale), ecological consciousness, environmental problems (occurrences like droughts, floods, extreme weather that could negatively affect food production), food safety concerns (higher vs. lower concerns within society), importance of health (high interest in healthy living vs. rather low interest leading to problems like obesity) and last, technological progress as a function of socio-economic factors that lead to the real application of knowledge and possibilities. Scenario 1: ‘Business as usual’. This is the reference scenario that depicts the current diversity and huge differences in the food and drink industry ranging from highly fortified and functional food over the trend of natural and organic products to fast food and food with no considerable nutritional value or even harmful ingredients. This scenario does not score high on overall innovativeness, although some sectors (e.g. functional food) will have great potential while others more or less continue their way of only small and incremental improvements in the future. Scenario 2: ‘Going natural’. This scenario depicts the growing tendency towards less food processing and food products perceived as natural by consumers. Much innovation potential, such as the utilisation of genetically modified organisms (GMO) or nanoparticles in food production as well as other high-tech experiments, is found in areas generally not popular with the consumer. But also conventional ‘fast food’ considered unhealthy will be replaced more and more by other fast alternatives such as salads or fruit. Here, innovations mainly lie in finding ways to process food with healthier ingredients (e.g. natural food additives) or improved testing and process automation. A growing consumer concern over the environment and ethics (e.g. animal rights, fair trade etc.) are driving factors. This scenario is more likely under conditions of higher economic prosperity and greater concern over health issues. But it can also become more likely if the perception of ‘industrial food’ and industrial food producers becomes more negative. Scenario 3: ‘Cheap and convenient’: This scenario reflects a situation where general prosperity as well as the interest in health, future and innovation declines. Contradictory information about nutritional health benefits as well as scientific fraud combined with higher budget consciousness leads to a growing disinterest of consumers in healthy nutrition. Budget (for some involuntarily), fastness, convenience and indulgence are major drivers. Resources for innovation are rather scarce, and companies are mostly interested in cost reduction. Scenario 4: ‘High-tech nutrition’: In this scenario, technological progress is fast and developments from different disciplines, from biotechnology to material science, influence innovations in food and drink manufacturing. The consumers tend to increasingly accept novel technologies in the area of food and drink. Health improvement beyond healthy nutrition only stands in the centre of interest. It is considered to be achievable only through advanced technological modifications of food and drink products, which even result in medicinal food. Scenario 5: ‘Emergency’: This scenario depicts a situation where some of the basic requirements of food security (availability and accessibility) are in jeopardy and the main goal for solutions and innovations lies in getting enough food. The ‘emergency’ scenario is certainly a kind of worst case scenario, but if sustainability were to be neglected, this could become a realistic outcome. In the principal, technological possibilities in the area of food and drink production is high and even growing. The major challenge, however, lies in bringing these possibilities in line with consumer interests, solving current challenges and fostering the developments towards desirable futures while also stimulating culinary diversity and protecting culinary traditions. The growth of knowledge-intensive services (KIS), including knowledge-intensive business services (KIBS), has been fuelled by the application of new technologies and changes in demand. The application of information and communication technologies (ICTs) is the most important technology driver of growth in KIBS. The application of ICTs creates new service opportunities but also provides new ways to provide services to clients and enhances the range of service firms. Demand-side drivers of KIBS growth include a higher degree of specialisation and division of labour in the economy, which leads to an increasing demand for external expertise and an increasing degree of outsourcing. In addition, internationalisation opens up new markets for service firms and facilitates international off-shoring. Based on these drivers, the scenarios of the future development of KIBS are sketched along two dimensions: (1) the degree knowledge can be codified, which is key to automated service provision and scale advantages; (2) the stability and fluidity of the business environment, which allows or hampers outsourcing, internationalisation, entrepreneurship and the emergence of new players. Combinations of the two drivers result in four scenarios. Future developments in the sector are particularly influenced by demand drivers and technology development. Demand drivers differ between aeronautics and space, with demand for aeronautics particularly shaped by expected growth in air travel, which in turn depends on economic growth and fuel prices. Space, on the other hand, is still a largely regulated sector dominated by public demand, making public demand and regulation key demand drivers. Future demand for space applications is largely based on addressing societal challenges, such as security issues, monitoring and managing transport as well as land, water and air resources. Generally, regulation is the largest source of uncertainty, primarily affecting future demand in aeronautics, for example through an emission trading system, but also in the space sector, with regulation touching on liability issues and space tourism. Key uncertainty factors that have a high impact and account for differences between the scenarios are the availability and price of energy, the level of economic growth and geopolitical uncertainties. These factors were identified as posing the biggest future uncertainties for the sector. Scenario 1: ‘Global green aerospace’: This scenario describes a peaceful, highly globalised world in 2040 that has successfully taken steps toward an energy transition assuring a secure energy supply at reasonable but increasing prices. Business people but also private individuals enjoy the freedom of being able to travel frequently and far away. Terrorism is not a major threat obstructing air travel. This leads to a flourishing aeronautics and space sector. New technologies and smart regulation lead to radical improvements in aircraft efficiency and emissions while the space sector allows monitoring and tackling many societal issues, such as climate change, environmental resources and mobility. Furthermore, free access to space and a global judicial system for space also allow the sector to flourish commercially. Scenario 2: ‘Regional aerospace’: This scenario describes a world in 2040 with strong regional power hubs and limited ties between them. No global agreement on climate change has been reached, blocking a smooth transition to renewable alternatives. Access to fossil fuels hence remains important and shapes international relations. This combination of realpolitik and protectionist tendencies leads to slow economic growth and rising energy prices, with large regional differences based on access to oil/gas resources. Europe tries to lead the way but struggles with strong international competitors. While still able to travel globally, people choose to take holiday trips within Europe, largely for economic reasons. With increasing rivalry between global power hubs, access to space becomes more difficult in this climate. Scenario 3: ‘Zero-sum games’: A rapid energy scarcity leads to highly fluctuating energy prices and interruptions in supply. Globalisation, thriving on cheap energy and transport, comes to a halt with severe economic adjustment processes. International holiday trips are reduced sharply with people adjusting their consumption patterns to a changed economic environment. Countries seek their interests in protectionist policies leading to a downward spiral and breakdown of multilateral institutions. Trade conflicts become the norm with resulting conflicts for access to natural resources. Security expenditure rises steeply at the expense of other policies, such as the environment. European integration is at stake. Overall, this is an unfavourable scenario with regions competing on a zero-sum basis leading to a deteriorating economic and social environment. The European textiles and clothing (T/C) sector is undergoing two main simultaneous developments: the move from a labour-intensive, low-technology sector to a knowledge-intensive industry and the ongoing relocation of production out of Europe. While new technological opportunities for the T/C sector are emerging, the move to a knowledge-based sector is still at an early stage and major challenges need to be addressed. A number of main drivers of change have been identified, including both technological drivers as well as demand-side drivers. Out of these technological drivers, intelligent clothing and smart materials are considered to be of outstanding importance. Findings in other technologies, including ICT and nanotechnology, are of growing importance and increasingly incorporated into textiles and clothing products as well. New production methods are another main technological driver, enabling the T/C sector to reduce the still high share of rather low-skilled manual labour, reduce the amount of energy and raw materials used, and increase the flexibility and quality of production processes. These new products and production methods are complemented by the more frequent use of e-commerce and other interactive technologies, offering a wide range of new business models. On the demand side, changes in consumer behaviour are driven by demographic changes, an increasing consumer awareness of factors affecting health and sustainability, and consumers’ attitudes towards counterfeit goods. As these drivers are of varying importance to either the clothing or the technical textiles subsector, two sets of scenarios were developed, each illustrating three different developments of the two subsectors within the next five to ten years in Europe. The scenarios developed for the retail sector followed the rationale that retailers are the link between consumers, on the one side, and a wide range of actors, on the other, including wholesalers, suppliers, logistics services, providers of payment systems, advertising and marketing agencies, construction services, waste industry and recycling services. The following drivers and trends were considered the most important ones having a high impact: diversification of lifestyles, transportation costs, regulation and the structure of the sector (further market concentration versus a more diverse landscape of retail and wholesale services). Scenario 1: ‘Big boxes everywhere & green big boxes everywhere’: In this scenario, discounters, supermarkets, hypermarkets and the retail chains are omnipresent. Production and distribution are efficient and the high competition between retail chains forces the retailers to lower costs. Because of the limited number of retail chains the diversity of goods is limited. On the outskirts of towns, large supermarkets target car owners. Retailers are entirely in the lead in terms of what they offer in their ‘big boxes’ and they define what producers have to produce. Retailers are focused on providing relatively low-cost options, achieving economies of scale and offering bundled products and services. The chains develop their own brands while some trusted brands have survived and prospered. Scenario 2: ‘Local markets – connected through the web’: In this scenario, local markets are strongly based on products produced locally. Because of strategies to reduce environmental impact and ensure continued economic support of farmers and local communities everywhere, local communities in Europe are interested in direct trade with developing countries. There is more local community-based trade between communities in different parts of the world aimed at bypassing established retail supply chains. At the same time, these local markets are linked through web-based networks, establishing a worldwide community of local market actors with the goal of optimising logistics, sharing knowledge on crafts, green production and cooperation. Brands are less powerful, but labels that ensure high environmental and social standards are more influential. Scenario 3: ‘The digital consumer’: In this scenario, the common internal market for e-commerce is fully realised and shopping takes place through e-commerce. Online shopping and physical shops are combined in various ways: Companies present their products online and organise settings where consuming and shopping is embedded in spectacular events. Tools for virtual experience have been developed, and consumers can learn about products from the experience of interacting with objects, people and the environment. Producers of niche products are expected to benefit from this scenario because they get easy access to consumers and can use the new opportunities provided by social networks. Scenario 4: ‘The rise of lifestyle stores and malls’: Providing more customer choice to meet changing lifestyle preferences is the defining driver in the ‘lifestyle store’ scenario. In this scenario, people are mainly searching for a stimulating shopping experience. This could be provided by everything from an ‘on-site eco-farmers’ market to a blend of high-tech entertainment and shopping facilities. Lifestyle shopping malls can include one or more buildings forming a complex of shops representing merchandisers and service providers that represent the special lifestyle. The lifestyle-oriented agglomeration of producers and customers offers new market perspectives for specialised producers and services providers that would otherwise not have access to a sufficient quantity of partners and potential clients. Scenario 5: ‘The supermarket as a public good’: This scenario may arise if values in regard to shopping radically change the retail and wholesale landscape. In this scenario, the main kind of distribution is a type of supermarket that is owned by society not by any individual or company. It pursues democratic values and gives more freedom of choice to the consumer – but also assigns them more responsibilities. Its operations are geared not primarily toward maximising profits but toward fulfilling ethical values and supporting the reshaping of society towards more sustainability and societal soundness. This kind of supermarket could serve the key collective function of providing a place of social integration at the local level. It could lead to more socially and ecologically conscious consumption and force all companies along the supply chain to ensure transparency. The Sectoral Innovation Foresight was part of the Sectoral Innovation Watch (SIW) project within the Europe INNOVA initiative. The foresight study aimed at exploring future developments in nine different sectors in order to identify potential policy issues and challenges of the future. The emphasis was put on developments that could possibly have a disruptive effect on the nine sectors under consideration, on the one hand, and on developments that are likely to be of cross-sectoral relevance to innovation, on the other. The Sectoral Innovation Foresight was part of the Sectoral Innovation Watch (SIW) project within the Europe INNOVA initiative. Europe INNOVA was launched by the European Commission’s Directorate General Enterprise and Industry as a laboratory for the development and testing of new tools and instruments in support of innovation with the goal of helping innovative enterprises innovate faster and better. It brought together public and private innovation support providers, such as innovation agencies, technology transfer offices, business incubators, financing intermediaries, cluster organisations and others. SIW aimed at monitoring and analysing trends and challenges. Detailed insights into sectoral innovation performance are crucial for the development of effective innovation policy at regional, national and European levels. The foresight on sectoral innovation challenges aimed to integrate foresight exercises to understand the dynamics of sectoral systems of innovation. The concept of sectoral systems of innovation and production (Malerba 2002) seeks to provide a multidimensional, integrated and dynamic view of sectors. A sectoral system involves not only a specific knowledge base, technologies, inputs and demands that determine its development, both trends and trend-breaking developments are also drivers of sectoral change. The interactions of the sectoral actors (individuals, organisations, networks, institutions at various levels of aggregation) are shaped by institutions and by drivers of change. Undergoing change and transformation through the co-evolution of its various elements, a sectoral system is affected by science and technology drivers and demand-side drivers as well. In recent years, a growing number of projects on sectoral innovation systems and on foresight concepts and activities have been initiated while a growing body of literature has been published. However, the two areas remained unconnected. Within the Sectoral Innovation Watch, the connection between these areas has now been made. The aim was to develop methods of sectoral innovation foresight for the development of a future-oriented innovation policy by identifying key drivers, emerging markets and requirements. Foresight, in the way it was understood in SIW, is not about predicting the future, but follows the approach of ‘thinking, debating and shaping the future’ (European Commission 2002). It thus aims at sketching different reasonable variants of possible future developments (‘scenarios’), the associated challenges, underlying driving forces and options for dealing with them. In order to achieve this, the foresight approach must look beyond current trends (which are nevertheless an important input) and, in particular, into qualitative trend breaks that can give rise to qualitatively different future development paths in the sectors under study. It is when these qualitative trend breaks are superposed that major changes in both innovation and markets can happen. This foresight exercise intended to look beyond time horizons that can be addressed by simply extrapolating current trends. In other words, to look sufficiently ahead for major changes to happen while at the same time staying sufficiently close to the present to remain relevant to decision-making during the next couple of years. While for some fast-changing sectors this may imply a three- to five-year time horizon (e.g. biotechnology), for others (e.g. construction) a ten-year time horizon may be more appropriate. Explore and identify the main drivers of change in the nine sectors under study. These drivers will be both internal and external to the sectors, with several of them being of a crosscutting nature. Identify and assess key future developments (i.e. main drivers, innovation trajectories, emerging markets, necessary co-developments, etc.). The emphasis is put on likely future innovation themes and emerging markets, more specifically also on the requirements and impacts that these innovation issues and emerging markets raise in terms of skills requirements, organisational, institutional and structural changes in the sectors concerned. Develop scenario sketches for the sectors under study that capture the major uncertainties ahead of us. Highlight key policy issues for the future, with a view to enhancing the innovation performance and competitiveness of firms operating in these sectors. Foresight aims at sketching different reasonable variants of possible future developments, the associated challenges, underlying driving forces and options for dealing with them. In order to achieve this, the foresight approach looks at driving forces, captured for instance in trends and trend breaks. Recognizing the fact that future developments are by their very nature uncertain and open to value judgement, foresight covers activities to think the future, debate the future and shape the future. It is thus not a tool for predicting the future but a process that seeks to develop shared problem perceptions, make differences in expectations explicit and identify needs (and options) for action. Thinking, debating and shaping the future of different but interlinked sectors is crucial today because innovation is a collectively shaped, distributed, and path-dependent process. Thinking, debating and shaping the future of sectoral systems has to embed the sector developments in contextual developments. Innovation at the sectoral level depends to a large extent on the developments within the innovation system, but it is also driven by developments in its environment, like for instance changes in science and technology. To explore future patterns of innovation, it is thus necessary to investigate these contextual developments as well as corresponding developments within a sectoral innovation system. Drivers, i.e. emerging trends and trend breaks in S&T developments, of expected demand – both internal and external to the sectors under study – that are likely to exert a major influence on emerging innovation themes. Broader crosscutting developments/trends (e.g. the extent to which globalisation affects a sector) are also taken into account. Innovation themes, which are seen as the results of the interplay of S&T developments and changes in expected demand. 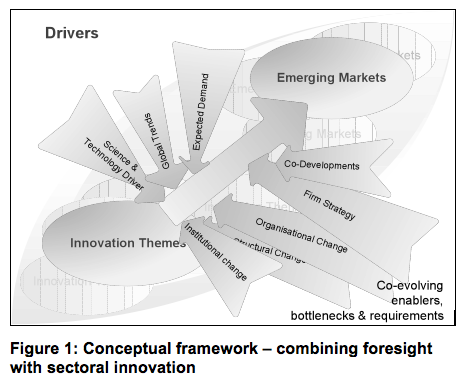 Emerging markets, which can achieve significance if an innovation theme evolves successfully, i.e. if potential barriers can be overcome and enablers be strengthened. Co-developments in and around a sectoral innovation system; they can serve as enablers of and barriers to innovation. They can even be essential in order to allow markets to emerge. Such co-developments reflect the aforementioned building blocks of sectoral innovation systems. institutional change, i.e. changes in the ‘rules of the game’ determining the interactions between the actors. In addition to these four building blocks, the co-evolutionary dynamics of innovation and change in a sector are captured by way of scenarios. Scenarios are to be understood as plausible and at the same time challenging combinations of these building blocks in a future-oriented perspective. Due to the uncertainties associated with contextual developments as well as with all other elements of the innovation system analysis, it is essential to think in terms of several, qualitatively different scenarios of the future, especially if a time horizon is chosen that goes beyond the scope of extrapolating current trends and aims at qualitative changes. In particular, the interplay of different drivers and their mutual reinforcement can give rise to major, even disruptive changes in sectoral innovation systems, with major implications for firm strategies as well as public policy. For each sector a review of secondary sources on foresight was carried out. This review covered, in particular, the situational analysis, the analysis of drivers of change, as well as a first view on innovation themes. The nine interim sector papers served as input to the workshop on ‘Sectoral innovation foresight: key drivers, innovation themes & emerging markets’ that took place on 23-24 June 2009 in Brussels. This first workshop aimed at validating and deepening the findings on drivers and innovation themes but also at exploring first ideas about future sector-level scenarios and associated co-developments. Interim findings were presented and discussed in working groups that dealt specifically with each individual sector as well as with the main crosscutting issues. The discussions with and feedback from the sector experts across Europe helped validate the interim results on key drivers, innovation themes, related emerging markets and associated requirements, and thus contributed to identifying the crucial issues for the future. The first workshop was attended by 60+ key players from the nine sectors, including industry representatives, scientists, foresight experts and policy advisors. On the basis of the results of the first workshop, the preliminary findings on emerging developments in the sectors were deepened. In particular, this phase evaluated the inputs to the scenario sketches from the first workshop and provided further input for the development of scenarios. Interviews were used to refine the understanding of the role of co-developments for the emergence of markets related to the innovation themes identified. Scenarios played a central role at the second foresight workshop in December 2009. Moreover, cross-sectoral issues were addressed, like, for instance, common drivers of change across sectors or inter-linkages between them. The second workshop also aimed at extracting those issues that – from a forward-looking perspective – are likely to require policy attention. The second workshop was attended by 60+ key players from the nine sectors, including industry representatives, researchers, foresight experts and policy advisors. The finding of commonalities across all sectors reveals what generic factors would be part of the basic pool of drivers to consider when aiming to for policy flexibility (‘robust policy strategies’) in the medium term. This will not reduce uncertainty but can improve preparedness against unforeseen developments while contributing to better policies focused on one single scenario (‘focused strategies’). In general, there are four main axes that, according to the foresight exercises done, are likely to determine and organise to a large extent the future development of the sectors of interest of the Sectoral Innovation Watch. These are, in no order or priority, general macroeconomic conditions, government policy and intervention, science and technology advances, and the human factor understood as susceptibility of population and democratic systems to broad societal challenges. In addition to these four main axes, other important key organisers of future sectoral developments include energy consumption and pricing and global industrial dynamics. The levels of income, aggregated demand and availability of capital are strongly related to macroeconomic growth. Here income must be understood as a factor that affects supply and demand factors. On the supply side, general macroeconomic conditions affect the cost and availability of financing, not only of R&D and innovation but also general investments in infrastructures and production systems. In turn, poor macroeconomic conditions affect employment and overall household income, thus influencing demand for goods and services across an economy. Despite the importance of innovation in the increase in total factor productivity and its effects on growth, the sectors under study are part of a larger industrial ecosystem where typical macroeconomic parameters affected by events beyond the industrial system produce chain reactions across sectors (i.e., the recent financial crisis). Close monitoring of interest rates, trade balances, and overall government expenditure and deficits at the national level must be considered in the design of any sectoral policy. Government intervention in the form of regulation is one of the largest sources of uncertainty across all sectors. Its development and stringency along the business cycle is a major moderator of science and technology applications (innovation). Entire sectors (e.g. space) depend to a large extent on public procurement. The empirical analysis of the SIW on the role of regulation to moderate innovation confirms the important role of regulation on innovation performance. Empirical evidence indicates a positive relationship between regulation and innovation. The foresight exercise conducted considered a large array of new technologies and innovation efforts likely to influence the direction and rate of growth in all sectors. Any sectoral policy must have a clear consideration of unexploited opportunities and technologies and innovation. An additional factor in this driver is the increasing pace of technological convergence that key enabling technologies bring. The set of foresight reports in the SIW have provided a broad account of current and near future innovations that will transform the sectors of interest to a certain extent. ‘Human factor’ refers to the susceptibility of citizens to very diverse issues that could be technology related or not. Important issues could be sustainability effects of consumption, travel behaviour, lifestyles, value given to health, safety, security, or risk technology perception, etc. Any demand-side policy targeting final or intermediate consumers or users of goods and services must take into account the susceptibility of the target population to a specific issue associated with the technology or innovation of interest. Global industrial dynamics includes a number of issues that determine the evolution of sectors. These include market structures, market saturation, flexibilisation of supply and demand, availability of skilled labour and the return of the issue of global value chain dominance. In itself, industrial dynamics is a major determinant of the evolution of sectors. Any policy initiative not incorporating clear conceptions of the likely evolution of industrial dynamics in the medium term will have little chance of success. The five factors described above form part of any robust policy that would ensure sufficient flexibility to face uncertainty and potentially haphazard sectoral developments. Montalvo C. and A. van der Giessen (2011) Sectoral Innovation Watch – Synthesis Report, Europe INNOVA Sectoral Innovation Watch, for DG Enterprise and Industry, European Commission, December 2011.